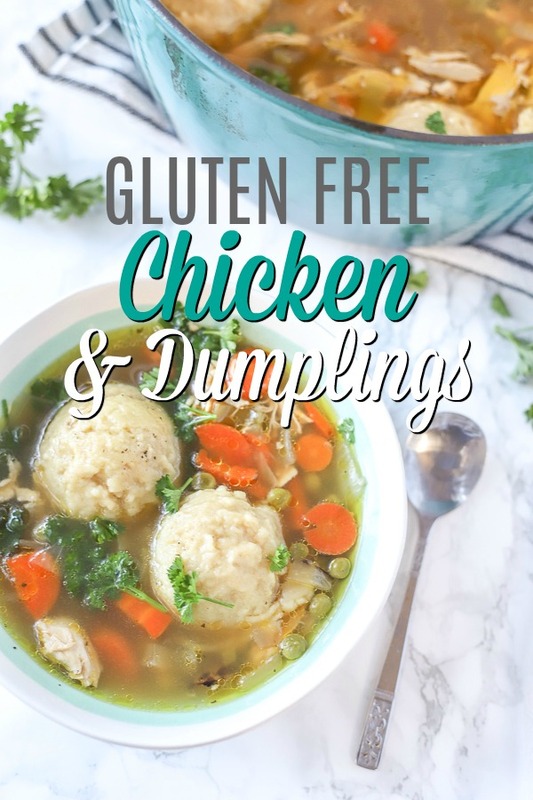 Try this warm and comforting gluten free chicken and dumplings recipe. 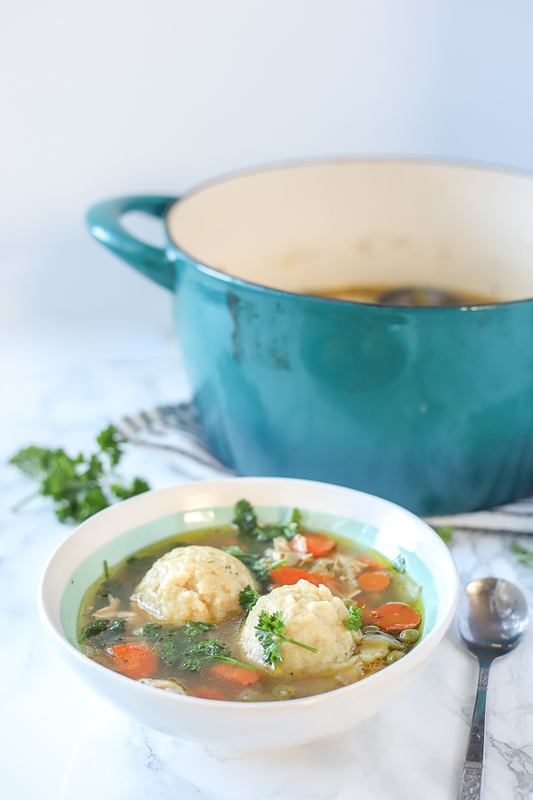 Soft, gluten free dumplings in a bowl of warm broth and vegetables seasoned to perfection. All the goodness of the classic, but made into a yummy gluten free version. Follow my tips below to make this delicious recipe super fast. For this recipe you will need: chicken broth, chicken, carrots, onions, celery, peas, spices, gluten free flour, eggs, baking powder, cornstarch and salt. I know what you’re thinking: Amy, it’s spring… aren’t we over soup season? Thankfully we have air conditioning, so we can enjoy soup all year round. She carefully crafted delicious blobs and was so proud. Then it inspired me to make some gluten free chicken and dumplings for her. Soup is her love language, as is mine, so I was very happy to make it. But I had to come up with a gluten free version of the delicious, classic recipe. August has been strict gluten free for a few months now. She was having some severe stomach issues that we had to look into. Luckily, she tested negative for celiac disease, but those few weeks of forcing her to eat gluten was pretty miserable for everyone. She would cry and complain of stomach pain pretty much constantly. 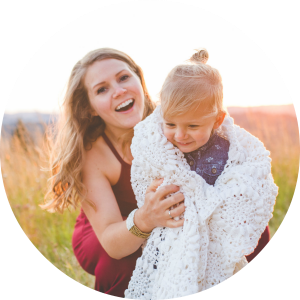 As soon as we took the test, we switched to a really strict (we were pretty loose before) gluten free diet, and her symptoms improved within 24 hours. We got the negative test results a week later, but after discussions with our doctor, we all felt it was better to keep her gluten free. Even now, sometimes someone will forget and August will get gluten, and she is in pain pretty much instantly. So I love creating recipes for her that are just like the “normal” version. August’s dumplings are gluten free and absolutely delicious. Make homemade broth or use store-bought (make sure it’s gluten free). Make this recipe super fast with pre-made chicken. I usually make a whole chicken and broth in the Instant Pot at the same time. Kills two birds with one stone… well, one bird with an Instant Pot. If you hate peas, take them out. You could also add corn, spinach, green beans, or any other vegetable you like to add to chicken soup. For the dumplings, you may have to adjust the liquid. If the batter is too dry, add a little more liquid – about a teaspoon at a time until it sticks together well. Large pot (I love my dutch oven), cutting board, knife, ice cream scooper (not necessary, but it makes it way easier to scoop and drop the dumplings in the broth), measuring cups and spoons. 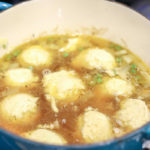 If using homemade broth, make it according to your favorite recipe. In a large pot, add a tablespoon of oil and saute onions, carrots, and celery until translucent. Add in broth and bring to a boil. Add in any other vegetables (peas, corn, etc.) and spices. While the vegetables are sauteing and the broth is coming up to a boil, mix dry ingredients together. Add in liquid ingredients and mix until just combined. The dough should be sticky, but also hold a good shape. By the spoonful, drop in the broth, then cover with a lid and allow the soup to simmer for 10-15 minutes. 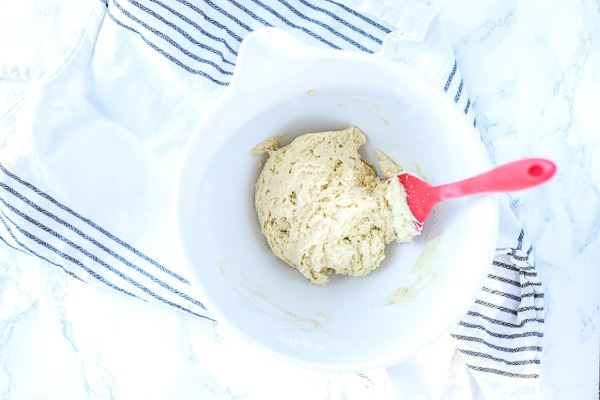 Want more delicious gluten free recipes? Check these out! This Spinach Frittata With Caramelized Onions is super yummy breakfast or dinner. 10 Minutes Chicken And Rice Soup is so easy and yummy. You have no excuse to not eat healthy with this recipe. Or how about some Chicken And Lentil Soup… can you tell I like chicken soup ha. This recipe is also soooo healthy. Italian Rice With Sausage is another quick and healthy family favorite. 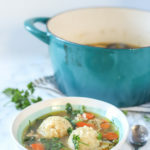 Warm and comforting gluten free chicken and dumplings recipe are soft dumplings in bowl of warm broth and vegetables seasoned to perfection. .In a large pot, add a tablespoon of oil and saute onions, carrots, and celery until translucent. While the vegetables are sauteing and the broth is coming up to a boil, mix dry ingredients together in a separate bowl. Add in liquid ingredients and mix until just combined.The dough should be sticky, but also hold a good shape. Drop dumpling batter into the broth and cover with a lid. and allow the soup to simmer for 15-20 minutes. Top with fresh parsley and serve. 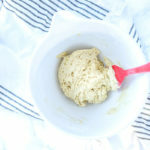 If you make them from scratch or use a gluten free biscuit dough. Normal biscuits are not gluten free as they usually contain flour. Can you use gluten free biscuits instead of making them yourself? Probably, I’ve personally never tried this but I know many recipe that use biscuits. 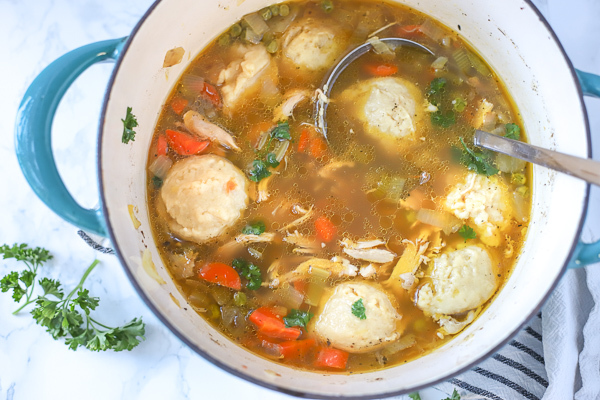 Do you love a warm comforting bowl of gluten free chicken and dumplings?